Nothing elevates performance more than coaching. Over the past decade, through studying more than 100,000 coaching interactions, we have found that coaching – as opposed to managing – is key to driving extraordinary results. There is no question that coaches develop and inspire people to do their best work, and they obtain more discretionary effort than managers. Growth in coaching, growth in individuals, growth in outcomes, and growth in sales — these are what our clients are looking for when they embark on a process for improving the coaching within their company. Their growth is of paramount importance to us, too, which is why measurement is the essential first step in our four-step coaching process. The most important way that we measure our clients’ coaching acumen and execution is by administering an “Eyes of the Team” survey. By asking team members about the consistency and effectiveness of the coaching they receive, we are better able to understand their organization’s current coaching environment. This not only helps us establish a baseline of performance but also allows us to tailor our recommendations and coaching process. Most of the time, our client organizations have never even measured coaching before, so they have no idea whether it’s even occurring or how well it’s being received by team members. Having this information gives them clarity about their current coaching effectiveness and how they need to improve. In today’s business environment, becoming complacent with your employees’ current knowledge, actions, and skill sets is a surefire way to begin the demise of your organization. Continual development — giving up old skills and learning new ones — is absolutely critical to individual and organizational growth. Education and training, the second step in the growth coaching process, is a crucial component of a coach’s growth journey. Unfortunately, too many companies view education and training as stand-alone events that will single-handedly provide what is needed to create behavior change and growth outcomes. But often, despite what is learned at an educational event, that knowledge is not applied and change is not implemented. The education process must begin with building the coaches’ understanding of the importance of coaching. Coaches aren’t going to change their coaching behavior unless they emotionally buy in to the need to do so. It’s important that training and education is not a PowerPoint-and-quiz type of event, as we are trying to get coaches to give up their preconceived notions and make changes in the way they coach. It is easy to say, “Go forth and execute,” but, by default, most coaches return to old habits and behaviors. The best way to combat this tendency is to create a collaborative implementation environment that is driven by bringing together people who are trying to improve their coaching behavior. We refer to these gatherings as implementation huddles. The focus of these huddles is on the continued sharing of best coaching practices and open discussion of the challenges to overcome. What would happen if doctors followed evidence-based medicine best practices only 54 percent of the time? What if engineers provided bridge designs that met only 54 percent of the safety standards they were supposed to meet? In most companies we’ve studied, coaches are doing only 54 percent of the necessary coaching activities. 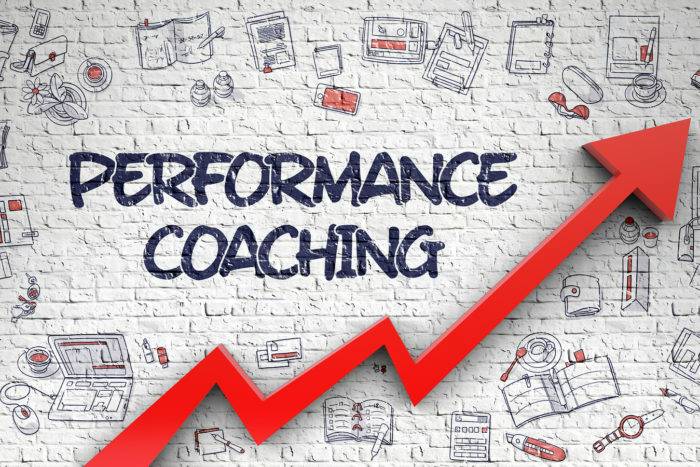 Further, when they are coaching their team members, 45 percent of coaches are falling short of the coaching quality standards they need to achieve in order to hit their performance goals. By measuring coaching quantity and coaching quality, we have become acutely aware that most coaches don’t know how their actions and behaviors affect the growth of their teams. They don’t know what to do, how often to do it, or how to do it well. Because the vast majority of coaches in the business world don’t have the data and information they need, they have been underperforming for decades. Analysis of this kind of coaching information not only allows a story to emerge but also solves a long-standing performance improvement mystery that, up to this point, has never been understood. That is, organizations would see different performance levels from teams, but the only data they could examine to explain this difference was on frontline performers. This information may answer the question in some cases, but without measurement of coach performance, there was a huge unknown variable. We saw the impact of the coach when we analyzed data across sales departments of our client organizations. Forty-five percent of managers fell below necessary coaching quality standards to hit their sales number. When we considered the average sales goals of these coaches, this translated to $4.1 million left on the table due to inadequate coaching. When it comes to creating high-growth coaches, these four steps, while independent, are inextricably linked. You cannot do just one of them and expect change. Simply put, if you want to build a high-growth culture, it takes consistent execution of the entire four-step process. Adapted from THE COACHING EFFECT: What Great Leaders Do To Increase Sales, Enhance Performance, and Sustain Growth by Bill Eckstrom and Sarah Wirth. Published by Greenleaf Book Group Press. Bill Eckstrom, co-author of The Coaching Effect, is the founder of EcSell Institute, a research-based organization that works with leaders internationally to help them better understand, measure, and elevate coaching’s impact on performance. Sarah Wirth, co-author of The Coaching Effect, is vice president of client services at EcSell Institute.